Marion Waggoner of the Save Our Water Committee speaks to concerned citziens at the New Garden Township Building on April 17. 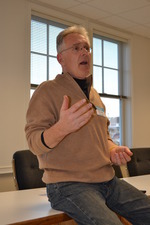 Over 50 residents of the Landenberg area packed a meeting room at the New Garden Township Building on April 17 in an effort to galvanize their opinions and gather additional support, in their effort to stop the Delaware-based Artesian Water Resources from tapping into what they believe is their water. Organized by the Save Our Water Committee, the nearly-two-hour meeting brought residents up to date on township ordinances and current committee activity, all in response to Artesian's recent aquifer test near the corner of Newark Road and Broad Run Road, during which more than 600,000 gallons of water were extracted from the well, at a rate of 200 gallons per minute. Artesian was granted the legal right to drill on the grounds – property they purchased from Leon Wilkinson several years ago – from the Pennsylvania Department of Environmental Protection (DEP) on Jan. 31. The results of the test are expected to be completed within the next few weeks. If the aquifer test on the well is found to have a sustainable withdrawal, it will be used as a pumping station for Artesian, and will expected to withdraw 200 gallons of water a minute, as much as 218,000 gallons a day – and over 100 million gallons projected over the course of one year. Artesian officials have insisted that the water would be distributed to southern Chester County, and supply area residents. Those in attendance at last Thursday's meeting felt differently. "There's no question that you can't pull that amount of area from this area without it having some effect on the rest of us,” said Marion Waggoner, president of the Save Our Water Committee, who chaired the meeting. "Artesian is running into a serious problem in New Castle County [Delaware]," he added. "They're starting to run short on water, and its serious enough now that in 2013, they were told to come up with a comprehensive plan to tell how they're going to supply water to Delaware. They've got to drill more wells, or build a reservoir someplace. They're obviously looking for sources of water." Landneberg resident Thomas Quann informed the audience of the involvement that he and other citizens took against Artesian in 2002, at a time when Artesian was considering tapping the Broad Run Well in order to distribute 800,000 gallons of water a day to Delaware. He said the potential deal was bypassed by Artesian on the strength of ordinances that were enacted by elected New Garden Township officials that tightened regulations on potential well water exportation. During that time, Quann said he delivered an address at the township building that called Artesian "robber barons," and stated that common, every day citizens were being taken advantage of. During his address to the audience, Quann directed much of his ire toward local land developer Charles Wilkinson, whose father Leon secured an agreement with Artesian for the Broad Run property more than a decade ago. "I'm pretty appalled that one of my neighbors," he said, referring to Wilkinson, "is so damn greedy that he needs more money, [enough so] that he would have to sell a well," Quann said. What's stopping us from selling our land for whatever reason, and saying, 'The Hell with my neighbors?' That's pretty much what he did. Any private well owner, any farmer who uses a well, any mushroom farmer should be awfully upset about this." Charles Wilkinson chose not to publicly comment on this issue. Litigation would not be coming from the citizen's group, Waggoner insisted. He said that there is currently no basis for the committee to take court action, especially given that opposition to Artesian's plans are now in the form of letters to Artesian from the township and from Sen. Andy Dinniman, as well as existing township ordinances. "A group of citizens going in and suing makes no sense," Waggoner said. "The judge would basically throw it out as a frivolous suit. It costs a lot of money and wouldn't do a thing for us." The key mission of the committee, he said, is to strengthen its numbers. So far, the committee has gathered 310 signatures to a petition, has130 residents on its contact list, a Facebook page, and has circulated dozens of yellow and blue signs throughout the township, that protest the potential drilling. Quann, Waggoner and Waggoner's wife Jane encouraged those in attendance to write to representatives of the DEP, including Alice Wright-Bailey, an environmental advocate for the DEP, and Deborah Fries, the DEP's community relations supervisor. Quann connected the current citizens' initiative to hold back Artesian to what happened in 2002. "I remember the reason we did this was because we were having a drought, and all of us were very conscientious about using water," he said. "This has been a fight for a long time and the reason it was successful in the past was because the people did it. They didn't just save their water. They saved our water. This is paradise. Let's keep it that way. "I encourage each and every one of you to tell your friends, tell everyone who has a well here, to get involved, because after it's gone, it's too late," he added. "The word from the masses is the most important thing. If we get a hold of our politicians, we get a hold of the people we elected. Then hopefully, we can get something done." The committee is scheduled to hold another meeting in three to four weeks.